Hello and Welcome to Sanity! My name is Laura Toto. I'm a very blessed mom of six, owner of Diaper Diva Designs LLC, creator of Naked No More brand of escape proof clothing and the "stay put" changing pad cover ... and ... I AM ON A MISSION!! It was through my own personal experiences with my growing little ones that I have created some sanity-saving solutions for a few common struggles we face as parents. 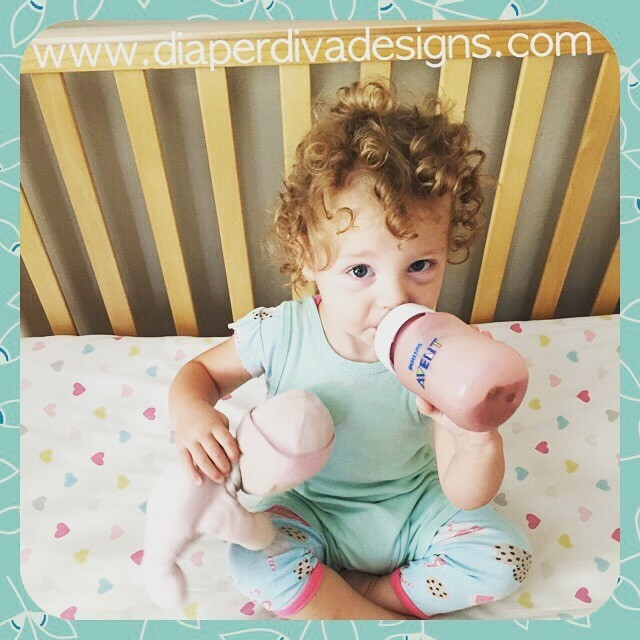 It is my absolute mission to help my fellow parents and caregivers with products that make our parenting journey a little less messy and a lot more peaceful! It all started when our third child turned one and discovered her new found ability to get naked ... on her own. She couldn't have been less interested in potty training and it became quite a "game". For two months my little houdini thwarted my every effort to keep her clothed and diapered. Nap after nap, bedtime after bedtime, I would walk into her room to find her diaper in this corner, her clothes in that corner and yet another indescribable mess to clean up. My sanity wearing thin, I knew that surely I can't be the ONLY parent dealing with this?? I searched online and found a few suggestions that included duct taping the diaper, at which my daughter scoffed triumphantly while looking like a little hula dancer in her shredded diaper skirt. Did I mention those diaper gel beads are next to impossible to clean up?? Next I cut the feet off of old pajamas, put them on her backwards and VOILA!! It worked like a charm!! Houdini met her match. Mom, however, was still not satisfied. There has to be an easier way. A way that will not require a complete outfit change just to lay my daughter down for a nap. A way that would allow me to continue using the drawer full of pajamas she already had. The light bulb moment hit in the middle of the night and by the next morning I was cutting, sewing, tweaking and retweaking until Naked No More was born! Actually welcoming the daily "houdini challenge", I excitedly hung my creation on the rail of my daughter's crib and waited for nap time. That first nap and that first night proved that I had something here! This little gem kept my escape artist dressed and diapered, didn't require a complete outfit change and she wore her regular pajamas at night! She even wore it alone as the weather got warmer. VICTORY!! From that very moment it became my absolute mission to make this a go-to solution for parents and caregivers dealing with this issue. And not a moment too soon. As my fourth child approached his first birthday, guess who followed right in his big sister's footsteps? And then AGAIN with my fifth AND sixth! But this time, I was ready. Since the original design, we have expanded into an entire line of "escape proof" clothing after having experiences with random-anytime-anywhere toddler strip downs! Working closeley with accomplished childrenswear designer, Carrie Carnes, we've completed the design process to include daywear options as well as pajama options. Our daywear options, while still a one piece, will resemble a two piece outfit and pajamas will have footed, non-footed, long sleeve and short sleeve options. VERY EXCITED about this line and can't wait to bring it to you!! So What About This "Stay Put" Changing Pad Cover? If you have a toddler, you've no doubt had a wrestling match or two during diaper changes. Somehow these tiny little peanuts have grown into strong little tornadoes and rarely enjoy stopping for a diaper change. This results in the sitting up, twisting, turning and any other movement that usually requires a parent or caregiver to have third arm. Since this is probably not an option, the "stay put" changing pad cover was born! I will spare you the less-than-pretty prototype (however it does work like a charm!). Our designs have been sent off for sampling and we look forward to bringing this sanity saver to you soon! I thank you for taking the time to learn about us and invite you to follow along as I venture on my momtrepreneurial journey. I would love to hear your comments and/or personal experiences and invite you to check out the testimonials page. Also, please be sure to check out our Teespring Store to shop our fun and inspiring designs for the whole family!